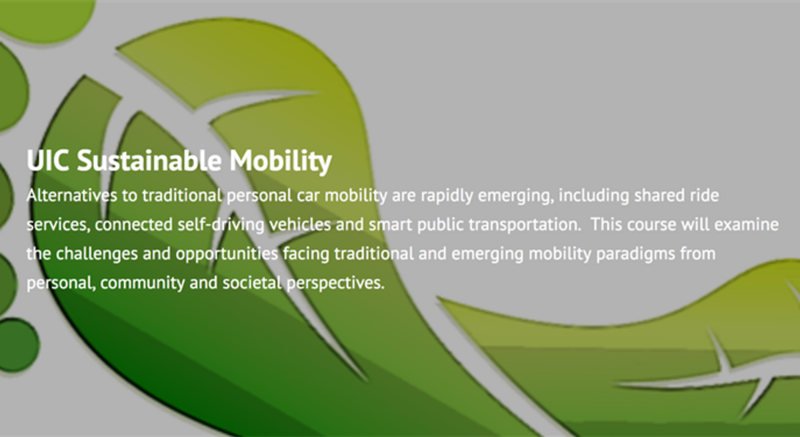 UIC Energy Initiative's George Crabtree, Elizabeth Kocs and UIC SISE Alumni Bryan Tillman have joined forces to bring together a unique and timely program- UIC Sustainable Mobility, a lecture series that will provide insight into tomorrow’s transportation systems. The lecture series involves prominent guest speakers from Chicago and beyond who will cover several advancements and current trends. Click to get a glimpse of the UIC Sustainable Mobility Lecture Series: CDOT on Bike Sharing & UI LABS City Digital on Data Driven Transportation!